The new "Safety Buoy" pool alarm is ideal for above ground pools, especially soft sided pools, as well as spas and small in ground pools where mounting the alarm to the deck is not possible. The "Safety Buoy" uses subsurface detection technology which is the technology recommended by the Consumer Product Safety Commission. It has been tested and certified by NSF International to the ASTM Standard Safety Specification for Residential Pool Alarms, ASTM F2208-08. 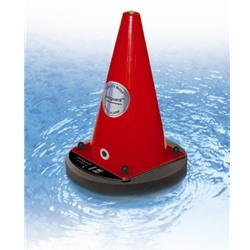 "Safety Buoy" comes with an In House Remote Receiver, has a 1 year warranty, and is Made in the USA! POOLGUARD/PBM INDUSTRIES, INC. has been manufacturing pool alarms, door alarms, and gate alarms since 1982. All Poolguard products are proudly Made in the USA. Poolguard Pool Alarms were tested and "Top Rated" by Good Housekeeping Magazine. Sleep Mode - when you would like to use your pool, simply remove the alarm from the pool and put it into sleep mode. Comes with an in-house remote receiver that has a range up to 200 ft., and comes with a 12 volt power supply.